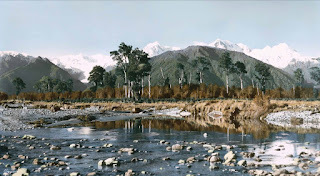 Whites Aviation produced hand coloured photographs of New Zealand for around fifty years. When they began in 1945 colour photography wasn’t accessible as it was only in its infancy so the hand coloured photographs they sold were very popular. These now iconic images can be found in cafés like Replete in Taupō or Vudu in Queenstown. 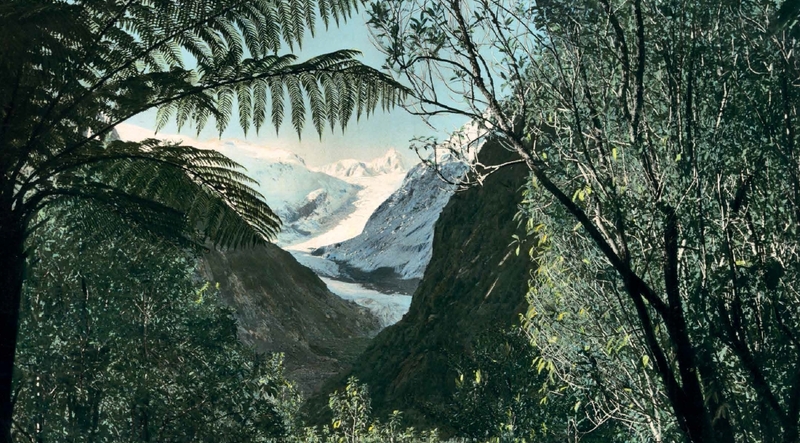 Peter Alsop has a forthcoming book on the topic which will be the first published collection of New Zealand hand-coloured photography. 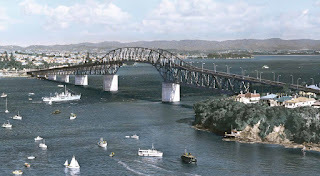 Peter is the co-author of previous books on commercial New Zealand art: Selling the dream on early New Zealand tourism art and Promoting prosperity on advertising art as well as last year’s biography of Marcus King. Ref: Fox Glacier, 1953, 380x685mm, Collection of Peter Alsop, Negative: similar to WA-33982-F, Alexander Turnbull Library. 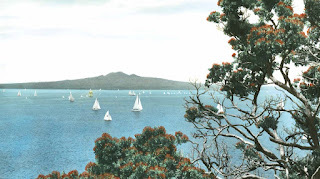 Hand-coloured New Zealand: the photographs of Whites Aviation includes the story of Leo White, the founder of Whites Aviation; Clyde 'Snow' Stewart, who was in charge of the hand-colouring team and celebrates the team itself, the 'colouring girls', who bought the vision to life… using cotton wool. This will be available to the public in November but the publisher is offering a pre-order discount of 20% using the coupon code WHITES. We’ve already got holds on the copies we’ve got ordered for the library! 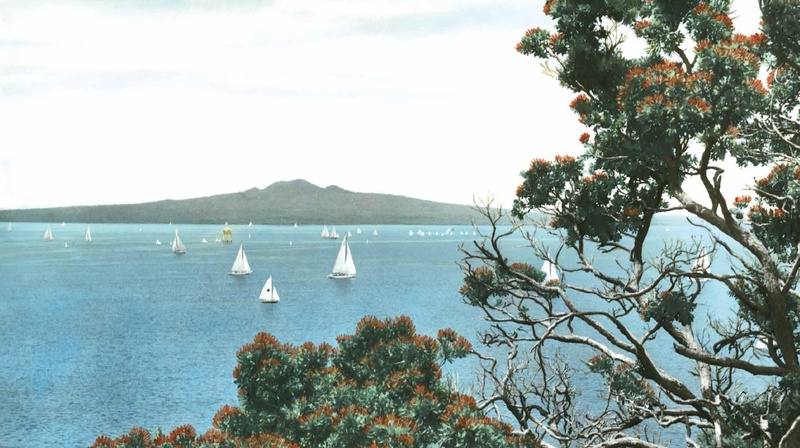 Ref: Rangitoto Island from Bastion Pt, 1954, 500x750mm, collection of Peter Alsop, Negative in Alexander Turnbull Library: WA-34549-F.
Peter has generously sent through a few of the beautiful images featured in his book as a preview. 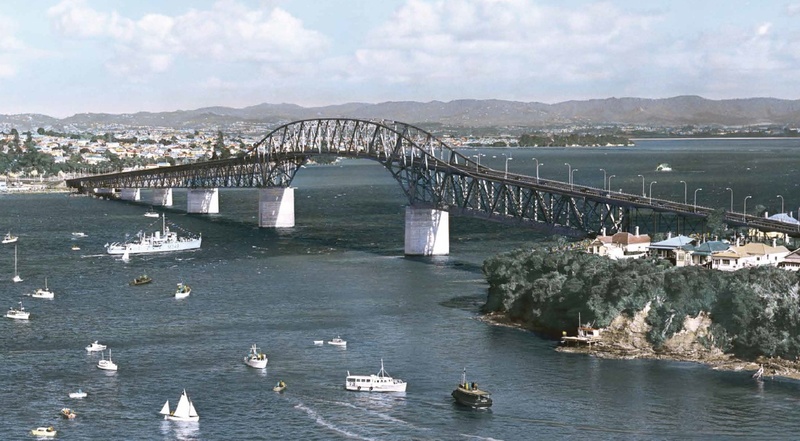 Ref: Opening of Auckland Harbour Bridge, 1959, 500x750mm, collection of Peter Alsop, Negative unknown. 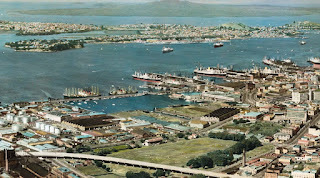 Grace Rawson worked as a hand colourist for Whites Aviation in the 1950s is the subject of a recent short documentary about these photographs. As she points out in the film these were not prints – each was individually hand coloured. As Peter writes in the book, nothing can change the authenticity and aesthetic of a hand-made craft. That being said it is still quite fun playing with this automatic colourising tool. An interesting exercise is having a go at comparing the hand coloured photographs with the ones coloured by the Algorithmia API. Ref: Clearwater, 1948, 560x1010mm, collection of Peter Alsop, Negative in Alexander Turnbull Library: WA-13613-F. 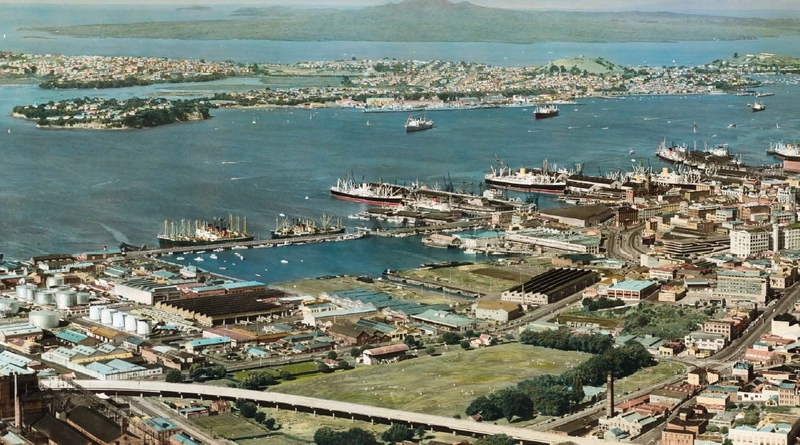 In 2007 the Alexander Turnbull Library acquired the collection of over 80 000 negatives produced by Whites Aviation. Over 60 000 of these have been digitised and are available to browse online.